I don't know about you, but I love watching artists create, whether it's drawing, painting, sketching, doodling, pasting, sculpting, whatever. I love it. There's something about the process - the in-progress piece of work - and seeing it come about as it happens that totally appeals to me. Writer Mac Barnett and illustrator Dan Santat have a new book out titled, OH NO! (Or How My Science Project Destroyed the World) It's about a little girl with a science project that runs amok in the city. It's a brilliant children's book, with excellent artwork by Mr. Santat. An added bonus is the book jacket: it folds out to reveal a one-sheet movie poster on the inside. Brilliant, I tell ya! As a parent I can relate to the frustrations many parents must have in finding any decent place to help educate their kids. Here in California we suffer from state budget cuts and schools continue to suffer from even more budget cuts when they already have nothing left to lose. So I gathered up some friends. A little over 30 children's book artists (any more and my head would have exploded), and they did their own interpretations of Mac's book "OH NO! (Or How My Science Project Destroyed the World)"and starting August 23rd people can begin buying pieces off of eBay. (There will be two auctions, one starting August 23rd, and another starting on August 30th.) There will also be a gallery show where all the pieces will be on display at the Nucleus Gallery starting August 14th. I will also be selling very limited edition prints from the book to go towards the charity as well as copies of the book itself. So, yes, the first auction has begun for this week! My piece is featured in this group and you can bid on the artwork HERE. Here's the official site for the show: Eyewitness Reports. 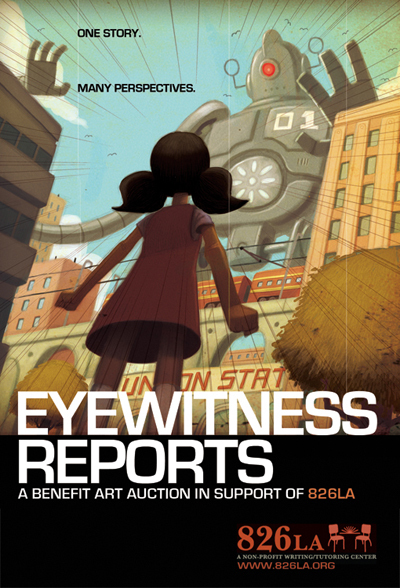 Here's Dan's blog post on the show and auction: Eyewitness Reports: A Charity Art Auction in Support of 826LA. Gallery Nucleus's page on the show: Eyewitness Reports. Hope you all can support a great cause here. Best of luck to ya!